Like many schools across the U.S., the AU community has experienced incidents of racism. These occurrences have left many women of color feeling isolated and in need of a community to confront those feelings - while facing the pressures of academics and student leadership. Shatina Williams, Ph.D., AU Counseling Center's Assistant Director for Outreach and Consultation, saw this issue and felt a need to reach these women. She and Calvin Haney, Associate Director of Leadership Development for University Center, discussed how they can help. They identified Sister Sister AU and AU Student Government's Women Initiative as two student groups to partner with. Together, they created three Women of Color Healing and Empowerment Circles dedicated to helping women of color at AU replenish themselves and reclaim their identity. "A peer of mine told me, there is a difference between being woke and having insomnia. You want to be conscious and deliberate in leading, but if you are not doing that self-reflective piece, it can tear you apart," Williams said. Sister Sister AU lead the first session and Devan Ogburn, SIS junior and President of Sister Sister AU, felt that before healing, the women first need to rid themselves of their stresses. "We had sisters first write down their stresses, and then talk through their experiences because vocalizing it can be a relief," Ogburn said. "Then we literally threw the stresses into a firepit." Ashlee Davis, Doctoral Clinical Intern for the Counseling Center, was there for the first session and said she was moved by the fire. "It was relieving and affirming to be able to share the space and burn items together in sisterhood," Davis said. Davis' fellow intern Nisha Gupta also felt empowered by the fire. "For me, it was so much like letting go. Being with a group of women of color and letting go was very special," Gupta said. Davis and Gupta lead the second session on behalf of the Counseling Center, and their goal was to create sisterhood, facilitate consciousness, and empower participants in the face of oppression. To help with that, they recited and discussed RuNett Nia Ebo's poem Lord, Lord Why Did You Make Me Black? "The poem was to affirm the power and beauty of black women, especially in contrast to the Eurocentric standards of femininity, womanness, and attractiveness," Davis said. The two counselors then gave everyone Akan names, which are based on the day of the week when they were born, and explained what those names meant. "One of the greatest challenges of slavery was the loss of our identity, including our names," Davis said. "I think that was a really important step in the healing process because most of our identities are formulated by society. To move forward in working with others, you must know who you are first," Ogburn said. The healing circles have been very beneficial to all who have participated. For students, they found solace in the participation by the Counseling Center staff. "Since those women already went through it, they have a more empathetic ear," Ogburn said. "Being able to share and feeling less isolated. I sensed that a lot of students were saying 'me too,'" Gupta said. There is one more healing circle planned for the semester on Nov. 15, and there is a desire to continue these in the future to continue to empower and build connections. Ogburn said she would like to see the healing circles go forward in a proactive way that does not wait for incidents to happen on campus. For it to be a lasting success, Williams encourages students to carry this forward as she has seen work at other universities. "What I would love to see is students take this and go for it on their own.... Some Universities have therapy groups for women of color every week. I would love to see that at AU," Williams said. 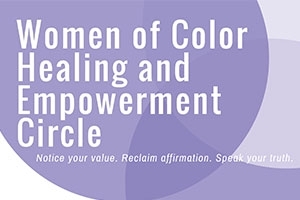 The next Women of Color Healing and Empowerment circle takes place Nov. 15, 5:30PM in MGC 3-4.